The trail, originally designed by Trail Master John Bates, offered several challenges, long, easy straight-aways and safety considerations along its entire length. With John’s passing in 2007, Bill Windsor and Rodger Logan assumed the role of Trail Masters. The John Bates Memorial Trophy, presented to the Junior Class winner, has been established to commemorate John’s passion for dog sledding, his contribution to our races and his unselfish devotion to our community. 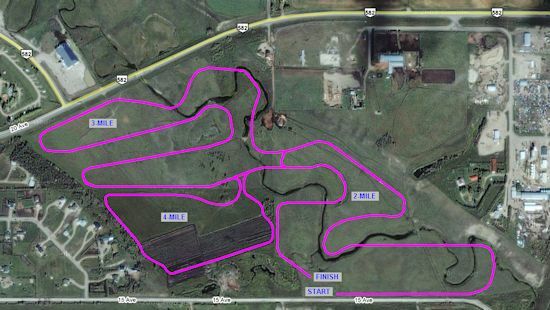 The race trail is set exclusively on privately owned land. The trail starts and finishes at the Staging Area located just off Township Road 31.2A. The Staging Area features mushers’ parking, volunteer parking, the Concession Tent, the Race Office and the Start and Finish Gates. It is readily accessible for foot travel off 15th Avenue directly east of Didsbury. Free Public Parking is provided directly south across Township Road 31.2A from the Staging Area. Major changes in the trail route were incorporated for the 2010 edition of the races. Both the 2-mile, 4-mile and 6-mile trails are entirely on the south side of Highway 582. This change allowed us to extend the Skijoring Class to the 4-mile trail and introduce a 2-mile Novice Skijoring Class. Virtually the entire 2-mile trail is visible from the Staging Area giving a greater degree of comfort for competitors in the Junior Class. In the summer of 2011 the task of placing bridges at each of the creek crossings was undertaken. By summer’s end there were bridges on all four creek crossings on the 2-mile trail making that portion of the trail suitable for year-round activities. We are very pleased with these changes. The trail features only one two-way traffic stretch, approximately 50 feet in length, where the trail passes through a fenceline gate shortly after the 4-mile/6-mile split and again just before the 6-mile trail joins back on to the 4-mile trail. Snow fence will be used here to divide the trail to prevent head-on collisions. Generally speaking, the trail is identified by trail markers (electric fence posts with flagging on top) along the race trail and snow fence at both distance gates and the start and finish gates. There are two distance gates on the trail, one for the two-mile split (Juniors and Novice Skijoring) and for the four-mile split (4-Dog and Skijoring 4-Mile). These are well marked by snow fence and trail markers.